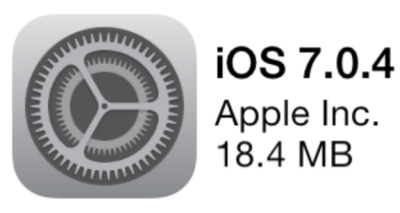 Apple released an updated version to its mobile operating system, iOS 7.0.4. Included in the update are bug fixes, security patches as well as some improvements. The latest update fixes a FaceTime issue for some that caused video calls to fail. An update has been made to iCloud Keychain, which was introduced in iOS 7.0.3. iCloud Keychain keeps your Safari browser’s passwords and credit card information in sync across your iOS and OS X Mavericks devices. The software update applies to the iPhone 4, iPhone 4s, iPhone 5, iPhone 5s and iPhone 5c. It is also available for the 2nd, 3rd and 4th generation iPads, iPad mini and the the newest iPads – iPad Air and iPad mini with Retina Display. For iPods, the 4th and 5th generation iPod touch models are eligible for the update. To update your device, go to Settings > General > Software Update and follow the prompts. Check Settings > General > Accessibility. In the ‘Hearing’ section, ‘LED Flash for Alerts’ should be off (white, not green). If it is on, move slider to left to turn it off. Hope this fixes your issue.